SCinet is the high-performance network built every year for Supercomputing with the primary mission of providing massive bandwidth for network research exhibitions & demonstrations. SCinet began 26 years ago as an effort to provide internet access to conference attendees and I doubt anyone in pre-Wi-Fi 1991 could have imagined what SCinet would look like in 2017. It’s hard to describe SCinet’s scale to people, but for a week every year it is the fastest network on the earth, fully connected to the Internet. Network speeds and the amount of connectivity change from year to year, but the trend is best described as “more bandwidth, more ports please.” In 2016, SCinet supplied 3.15 Terabits of network bandwidth to the expo hall, with 5,700 devices connecting to their Wi-Fi network. SCinet is built from scratch every year by a worldwide group of volunteers from academia and research, while all the network infrastructure is provided by select industry vendors just for the show. Five Extreme Networks systems engineers are assisting with the construction and running of SCinet throughout the conference. Volunteers have already begun building SCinet, starting three full weeks prior to SC17! Their first task is to start laying 40 miles of fiber throughout conference center; this fiber will interconnect the OTN (Optical Transport Network) nodes and network infrastructure of SCinet. While the fiber is being installed, all of SCinet’s hardware is pre-staged, configured, and tested in a separate location. 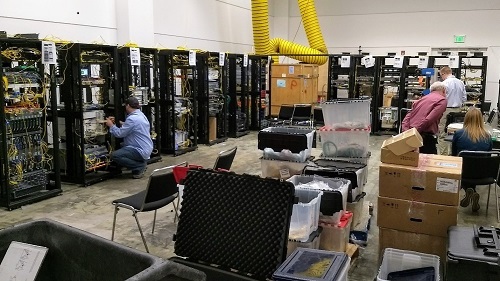 The final phase of setup will move all the racked hardware to the different ‘NOC’ & ‘DNOC’ locations on the expo floor and begin connecting all the different booths. Total connectivity won’t be known until the show ends, but for this year SCinet will have a completely 100G backbone, with more than 25 100G links to the Internet through CenturyLink, plus additional 100G connections to Internet2 & ESnet. I’ll be explaining this more in a future post, but the result is that SCinet is a real production network for the week of SC17. Extreme Networks support of SCinet began in 2002, originally under Foundry Networks and then Brocade, and it continues for 2017. This year we are providing our SLX-9850 router to help aggregate all the 100G connections for Expo Floor booths, along with our VDX 6940 switches for 10G connectivity. The SLX is our new routing and switch platform and combines technology from our MLXe & VDX products. The SLX-9850, our chassis in the new SLX platform, was built for high bandwidth applications, like data center switching and backbone routing. SCinet will be making use of the router’s 100G/40G FlexModule to provide 30 100G connections. The card and the SLX are fully line rate, meaning the 8 slot SLX 9850-8 supports 288 full speed 100G ports. There’s more to the SLX than capacity; it provides dedicated visibility & analytics features imbedded in the box that we’ll discuss in upcoming blogs. For now, you can learn more about the SLX by visiting our product capabilities page. 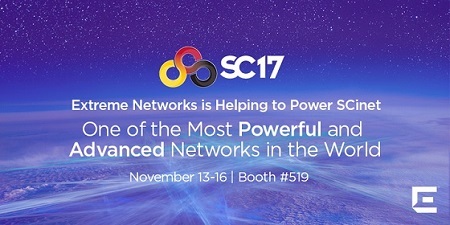 And for a good overview of SCinet at SC17, check out the brochure! 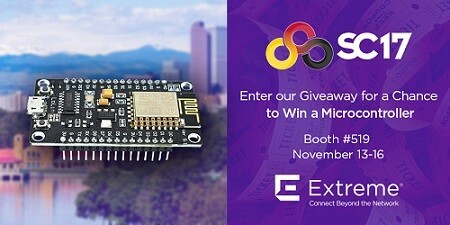 If you’re attending SC17, make sure to visit Extreme Networks booth #519 and sign-up for our VIP Booth Tour to receive a microcontroller!